Personal Shopper is not what you'd expect from its title or trailer. Written and directed by French filmmaker Olivier Assayas, it is not a film about the glamorous fashion world, though, as a backdrop, it does serve as a jarring contrast to the protagonist's personal life. It isn't entirely about the supernatural, either, in spite of some strange events. Rather, it's an exploration of grief and identity following a tremendous loss. Starring Kristen Stewart, who previously worked with Assayas on Clouds of Sils Maria, Personal Shopper follows Maureen, a young American working in Paris. Just over three months ago, Maureen's twin brother passed away, and she's been trying to communicate with him ever since. She has a life somewhere—a boyfriend waiting for her—but she lingers on in Paris in a job she feels no connection to, hoping for a sign. "Maureen is like half a person," Assayas says when we meet him in New York, midway through Personal Shopper's festival run (it premiered at Cannes, and screened at the Toronto International Film Festival, the New York Film Festival, and the London Film Festival, among others). "It's not like she's just mourning, she's lost half of herself and wants to become one again," he continues. "It's a very lonely process—the process of mourning is always lonely—and it puts into question issues that she never had to deal with before. All of a sudden, she's forced by life to reinvent herself." EMMA BROWN: When did you first start working on this film? 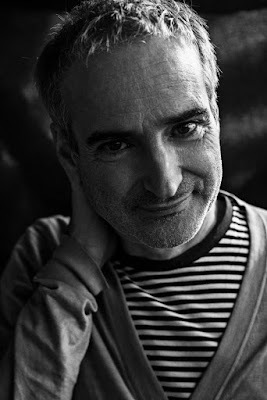 OLIVIER ASSAYAS: I started working on this film exactly in November 2015. I was coming back from Toronto where I had been preparing a film that fell apart. We lost our financing 24 hours before shooting, so it was like, what's the next move? I just sat down and wrote, fairly fast, this screenplay. I started from scratch. Usually when I write scripts it's a long process. It's layer after layer, I take notes, come back to it six months later, and so on and so forth. Here, I wanted to do something with the energy of the moment—the desire I had to shoot and somehow overcome the frustration of that movie that did not happen. I wrote it in the winter of that year. I like to start preparing the film as early as I can because you need to keep the energy going. I hate to write and spend months just waiting for the film to get financed. Then when you start preparing the film and you shoot it, you've already forgotten why you wanted to make the film in the first place. I like to have some kind of coherent energy that takes you through writing, preparing, shooting. BROWN: Did you begin with the character of Maureen? ASSAYAS: Absolutely. I had nothing else but the character of Maureen. It grew from there. I was drawn to this character who was a part of the proletariat of the fashion industry and who did a job she didn't like and found some salvation through imagination, art. It grew into something slightly different, but that's where it started. BROWN: When did the idea of Maureen trying to communicate with this other world come about? ASSAYAS: I just pushed the idea towards that fervor. Initially, it was all about finding consolation in art and music, but that was not enough. That did not give me enough drive. I wanted to make a movie that would deal with what we call the paranormal. I think what inspired this film was also this kind of mood. Except I was not sure where the limit was, where the border was, and gradually I pushed the border and realized that what I really wanted was someone who finds the door to another world. That involved, of course, the ghost and other things. Movies are explorations; they take you on a path, and I think it's always better if it's a path that you don't know, that takes twists and turns that you can't predict. That's what's entertaining about movies. That's what's entertaining about novels. I like the idea of something that's rooted in the material world, that's very down-to-earth. We're following someone who does this everyday, very mundane job, who carries bags from one place to another and drives her bike. And gradually, it morphs into someone who's involved in something a bit more complex than that. The idea to have both something that belongs to what we call supernatural and, at the same time, is anchored in the real world, I think it gives more strength to whatever has to do with the real world and whatever has to do with some transcendence of the material world. BROWN: It's interesting that you chose to make Maureen a personal shopper. As you say, what she's doing is pretty mundane, but she's still in the fashion world, which is something that we think of as very glamorous and not mundane at all. ASSAYAS: It was interesting to me to have both. I wanted her to deal with something that has to do with the surface. It doesn't get more materialistic than the fashion industry, which is defined by the fact that it deals with surface. Also, there is nothing more alienating than dressing another person—doing a job that is literally separated from whatever is any of your personal or individual concern. That's one side of it. The other side of it, I wanted it to be something she could be ambivalent about, the same way we are ambivalent about our relationship to the modern world and how the world is changing around us. It's both scary and fascinating, and we are afraid of it, but at the same time we want to be a part of it. I was also interested in something that could also be part of her own questioning, trying to connect with her own femininity. She's not sure of the person she is anymore. BROWN: Did you always know you wanted Kristen to play Maureen? ASSAYAS: Consciously or unconsciously? I wrote it not sure she would do it; I thought she might be scared of it or think it's too weird. I could've understood it. I did not want to admit that I was actually writing for Kristen because I didn't want to be disappointed. Then when I finished the screenplay she was in Paris and we discussed it and she read it and related to it. I think it had been for her all along. BROWN: You said at the Toronto Film Festival that Kristen was really a collaborator in terms of the direction. Is that something that has happened to you before with an actor? ASSAYAS: It happened when I was working with Édgar Ramírez when we did Carlos. Édgar brought a lot to the story, because he was in every single shot, every single day. He carried the burden of the relationship to Carlos. Carlos is a horrible character in many ways, and I think that if I had to deal on my own with the issues of Carlos, it would have been unbearable for me. Édgar just took over in that he carried on his shoulders the weight of Carlos. In that sense, it was a similar collaboration. I think it was also a bit similar when I made Boarding Gate with Asia Argento, who is an actress somewhat similar to Kristen in terms of her mixture of intelligence and instinct. But still, I think that in Personal Shopper I pushed it in a different area. In Personal Shopper, there is basically one character who defines the emotion in the film, who recreates the film from the inside. Whatever the film is, it's a creation we share, Kristen and myself. BROWN: I saw Personal Shopper at TIFF, and when I was coming out of the cinema, the people behind me where talking about how they thought Maureen was in Limbo throughout the film. ASSAYAS: Sure. It's not a wrong way of seeing it. BROWN: Has anyone ever said something to you about one of your films where you felt like, "Oh, I never thought about that before, but that makes sense"? BROWN: When you are developing a movie, making a movie, and the showing it to people and discussing it, it's sort of this living entity. Is there a moment when is no longer alive for you? ASSAYAS: Totally. I think that the mourning process of the film involves discussing it, dissecting it, and at some point, you get bored with it. I'm not there yet, but I know I will be there at some point. That's the moment when I know I need to turn the page and move on and recharge my batteries.